I’ve talked before about how some lures and techniques travel around the world. Spybaits are a perfect example of how that happens. They started in Japan, moved on to the West Coast and are now starting to get popular in the Midwest. Spybaits are simple enough, really. They have a cylindrical body with a prop on each end. The idea is to let the lure fall to where the bass are holding and then gently bring it back with little or no motion other than a smooth glide forward. The props are, or should be, turning slowly to give the bait a subtle, lifelike look and create just a little water disturbance. The best spybaits have an easy kind of shimmy to them as they fall. Some guys like to call it a death quiver. Regardless of what you call it, it’ll make the lure look like something alive that’s in trouble as it drops towards the bottom. That’s the first step in catching bass with this style of lure. The next step is to make it move forward with little or no action. You can pull it if you want but I prefer something a little different. I like to make about 20 turns with my reel handle and then bow forward towards the bait for a few seconds. Sometimes I move it real slow. At other times I speed it up to medium. But, I never bring it back fast. The thing is, though, whatever you do you need to create a neutral action. That’s the real key to this bait. Make it move along in a slow and gentle manner after it’s done its quiver thing on the fall. 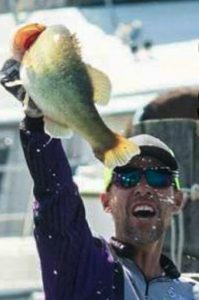 Spybaits are not designed to create reaction strikes. Don’t think of them that way. They’re all about heavily pressured or neutral feeding bass. Spybaits are designed to make them bite when they’re not all that interested in biting. My preference for a particular bait is the Storm Arashi Spin 08. It’s small, only 3 1/8 inches long, and it’s fairly light with a weight of 1/3 ounce. And, its sink rate is just right — not too fast and not too slow. Honestly, it’s the best spybait I’ve been able to find. I use spinning tackle for this technique. 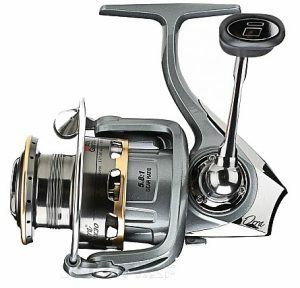 I throw my Arashi 08 on a 7 1/2 foot medium Ike Approved Abu Garcia rod with a Number 30 size Abu Garcia spinning reel. This is one of the few times that I don’t use braid with a fluorocarbon leader. I spool completely with either 6 or 8-pound-test Berkley Trilene 100% Fluorocarbon. It gives me better action and helps keep the bait down. You will get a little line twist with all fluorocarbon but that’s a price well worth paying for the increase in performance. Pick up a couple Spybaits and throw them in your tackle box. They’ll come in handy this fall.